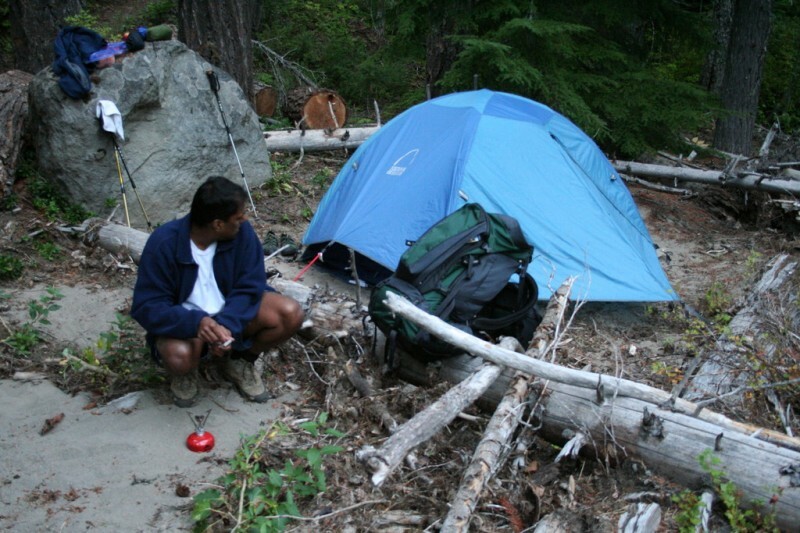 This was a one night backpacking trip I did with my friend Sam on the east side of Mt Hood. There were at least two different approaches to the meadows that we could have taken, but this time we chose the longer one. We think it was about seven miles each way, but it could have been closer to six miles each way, depending on whether you believe the map or the signs on the trail. Anyway, we got to the trailhead sort of late since we both worked a half day, but it ended up working out really well. Because of our late start we chose to stop for the night at a pretty ideal spot maybe three and a half miles in that we would have otherwise passed up. 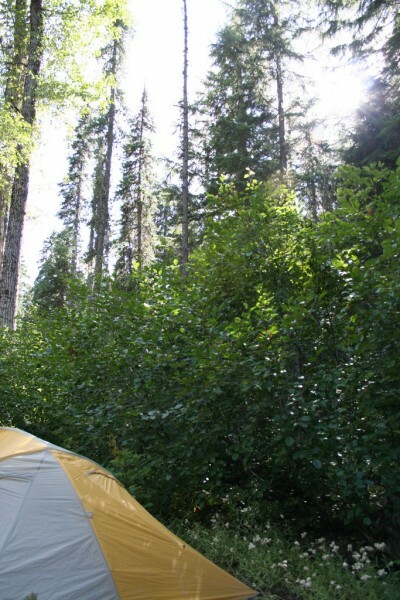 It was right by a nice big creek and there was enough room for both of our tents. 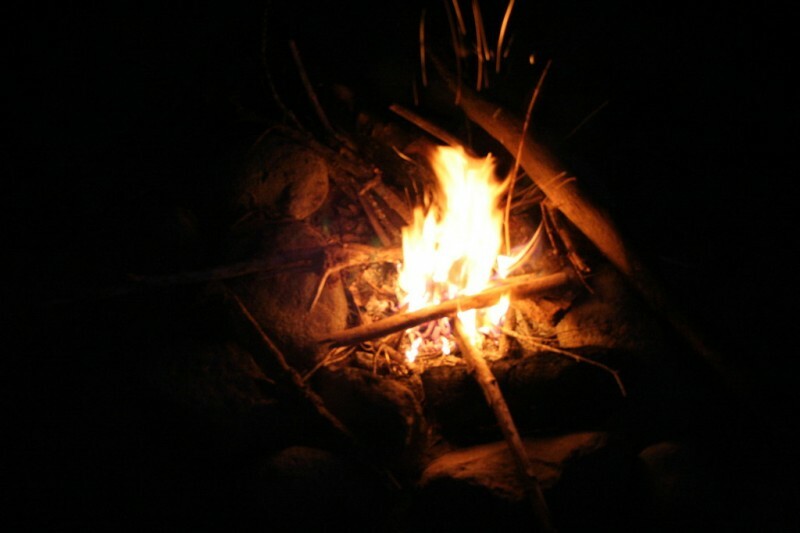 It also had an obvious fire pit so we knew we could make a fire, which we enjoyed immensely on that chilly night. The next morning we left our gear at the camp site and took just water, Cliff Bars and my camera as we hiked in to the meadows and back. 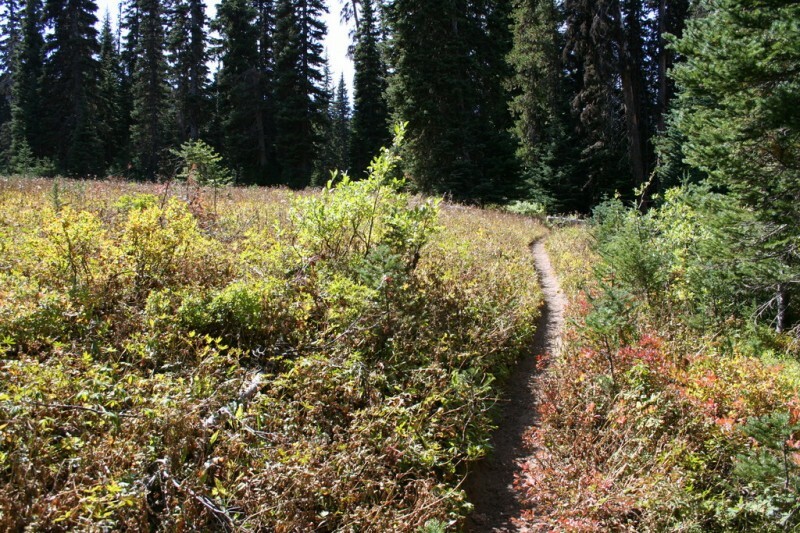 The views at the meadows were great and it was a nice hike–fairly gradual most of the way. 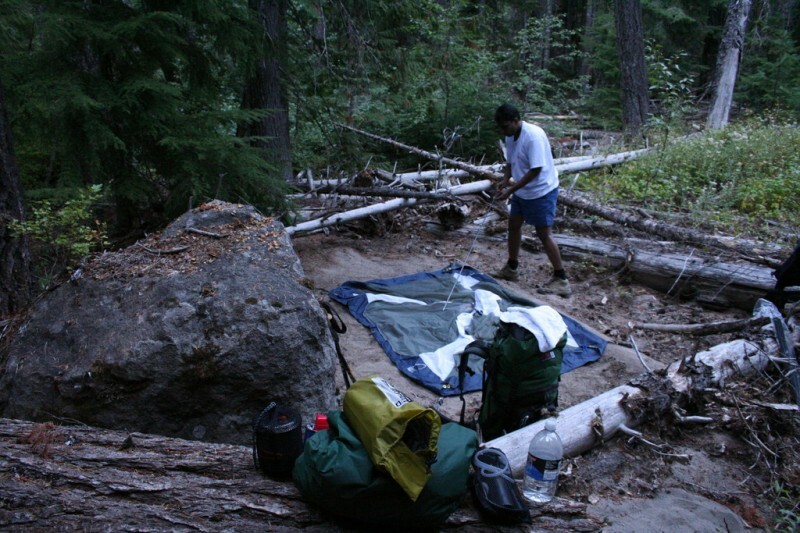 When we got back to camp we ate lunch and then packed up and headed out toward the trailhead. On the way we made a little side trip to see beautiful Tamanawas Falls, which we didn’t have time to do on the way in. Because of our late start we tried to move fairly quickly, so this was the first place where we stopped long enough to get my camera out for a photo. 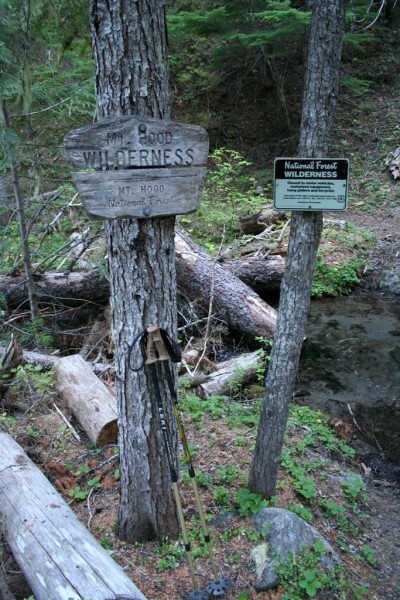 I think this wilderness station was maybe a mile and a half in or so, a little bit before the actual Mt Hood Wilderness boundary. We stopped here to register our visit with a Wilderness Permit. 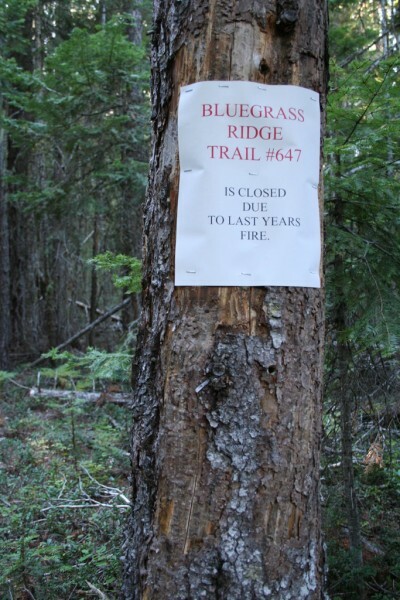 We saw evidence of a fire, perhaps the one this sign refers to, on our way from our camp site to the meadow. I have photos of that section later. 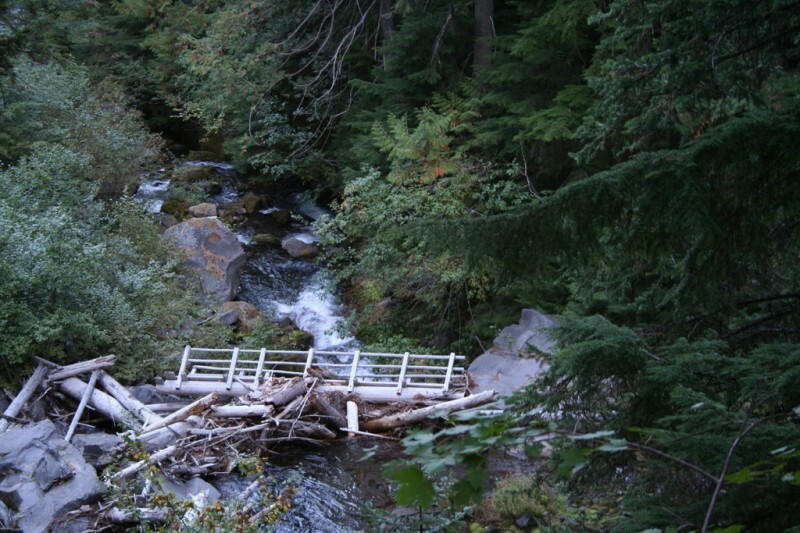 Here was the actual wilderness boundary and our first creek crossing. I believe Sam was checking out his leg here because he had just gotten stung by a yellow jacket or something. He never saw what got him but something got him pretty good as he was walking along. I kind of assume it was a yellow jacket because there were ridiculous amounts of them at the meadows later. 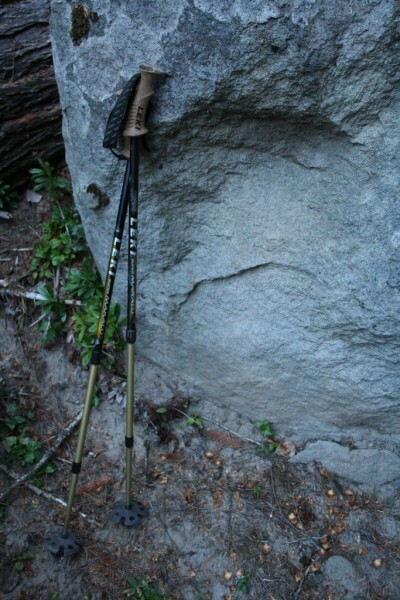 For the last few trips I've started using trekking poles, and this time I think I finally figured out how to use them effectively. I used them on Dog Mountain earlier this year, and I think they actually tired me out more because I didn't have their hight adjusted correctly for the slope. 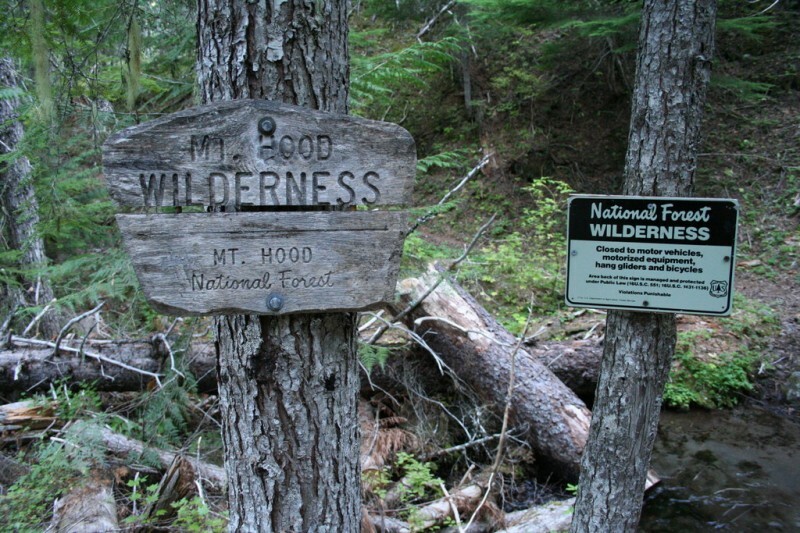 A closer look at the Mt Hood Wilderness Boundary signs. So, maybe about three and a half miles in, it was starting to get late and we were starting to look for potential places to camp for the night. We were very fortunate to have found this spot just at the right time. 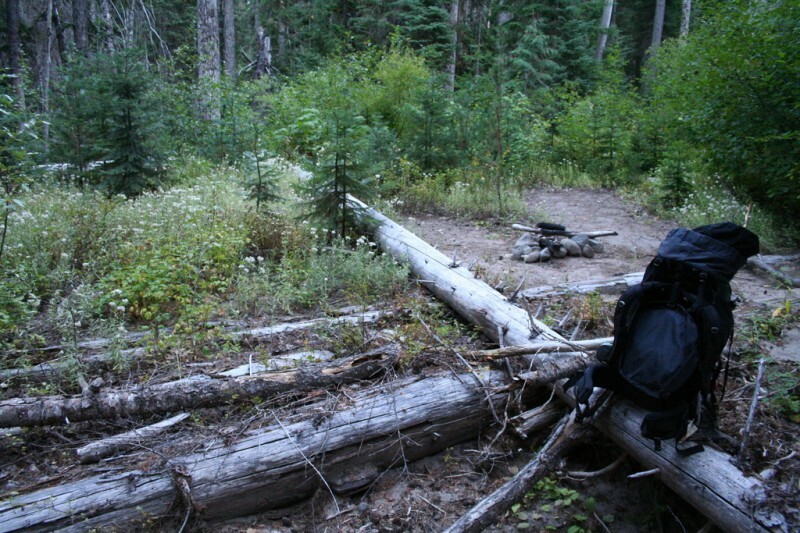 This was one of the only places where it was even possible to set up camp between the trailhead and the meadows. 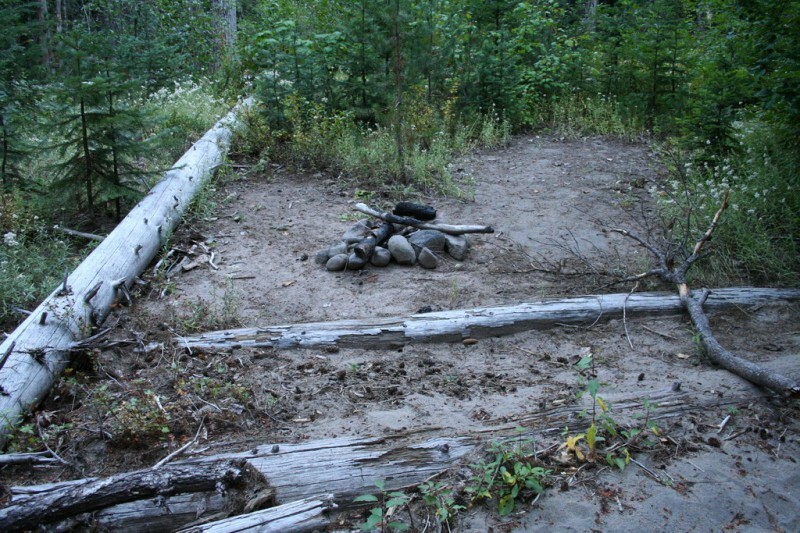 This photo shows the place where I would pitch my tent as well as the nice fire pit that was left for us. 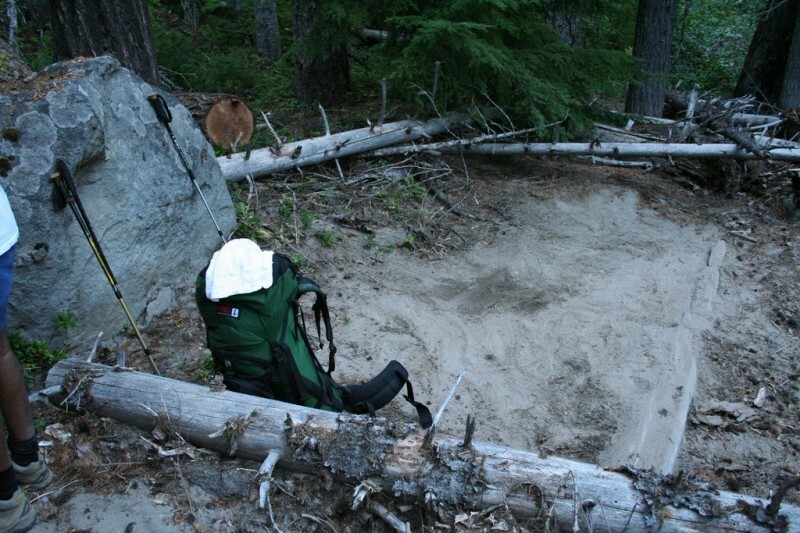 This was the spot where Sam would pitch his tent, and this big rock made a great place to put gear until the tents were up. As I said, this big rock was useful for many things, like my poles. So, this was one of the reasons we decided to camp where we did. 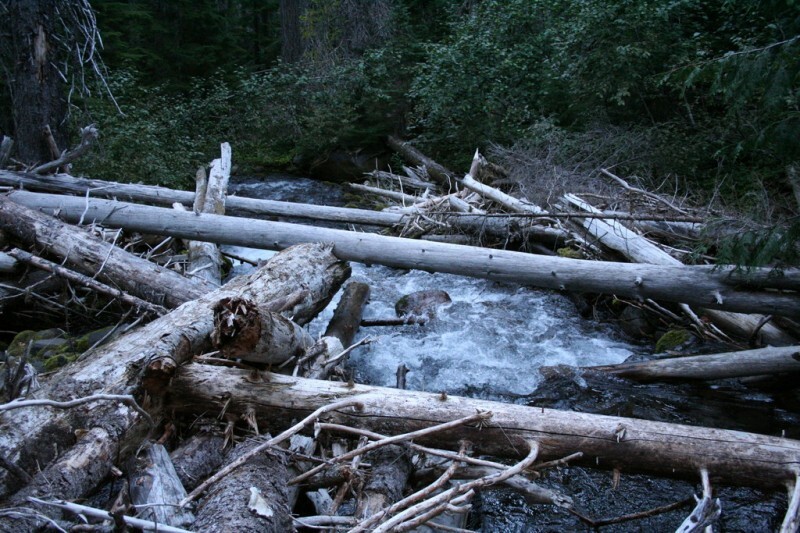 Our camp site was just before this required crossing of Cold Spring Creek. 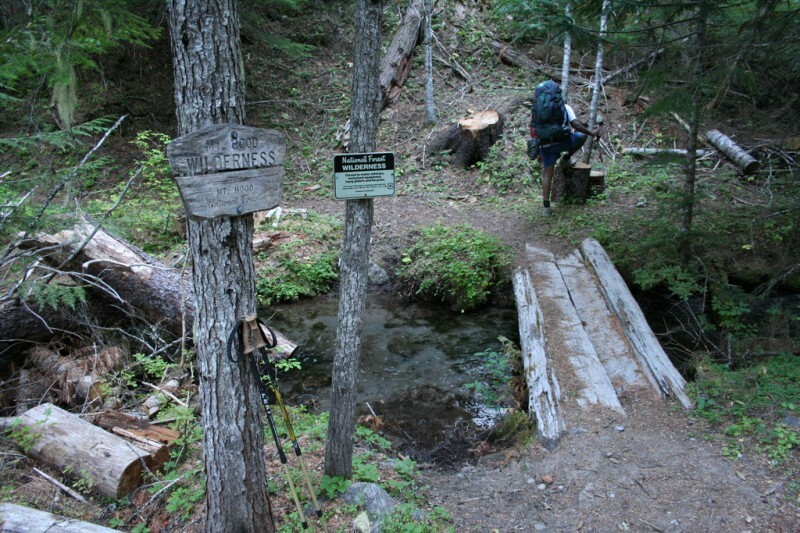 This spot made a great place to get water, but it was a little intimidating to cross especially with our big packs on. 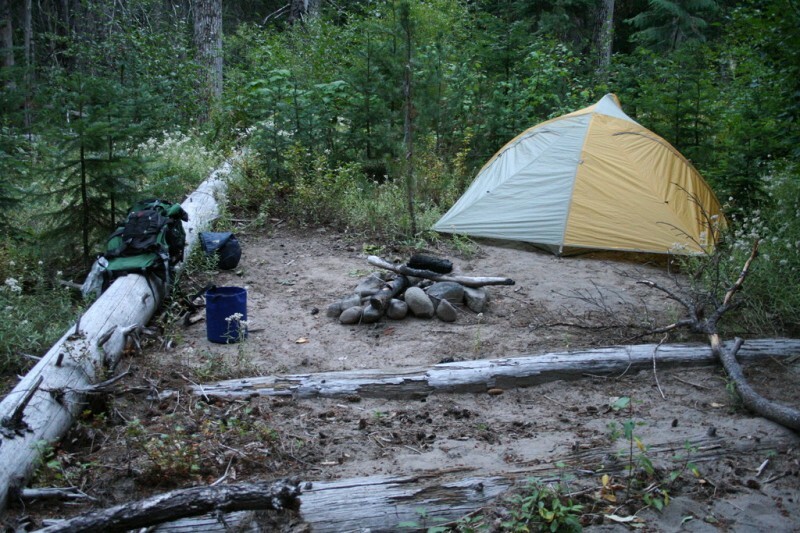 Fortunately, we left our gear at the camp site and crossed this log with just a few essentials the next day, and it wasn't too bad. 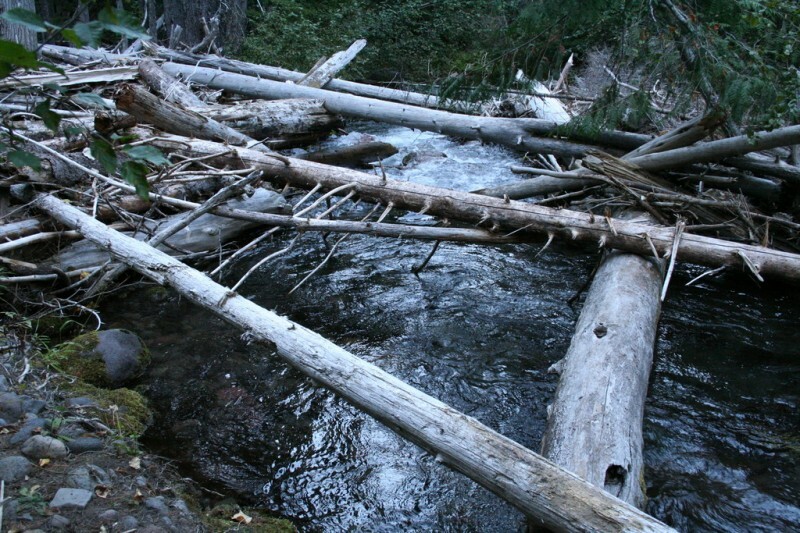 The water below the log was maybe four feet deep, very cold, and the current very fast, so we definitely didn't want to slip! The view at the crossing was pretty neat. 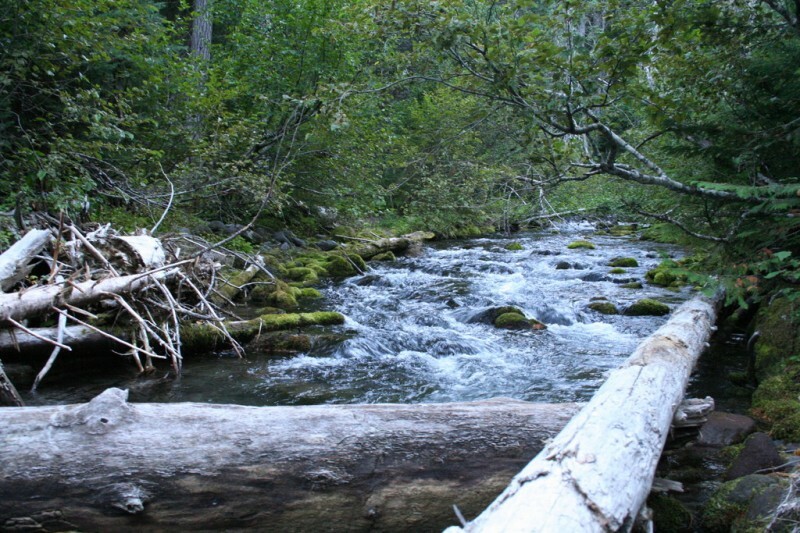 This was looking just downstream of the crossing. Sam and I ended up bringing two separate two or three man tents because Sam had just gotten a new one he wanted to try out, but it was a little too short for both of us to sleep in. 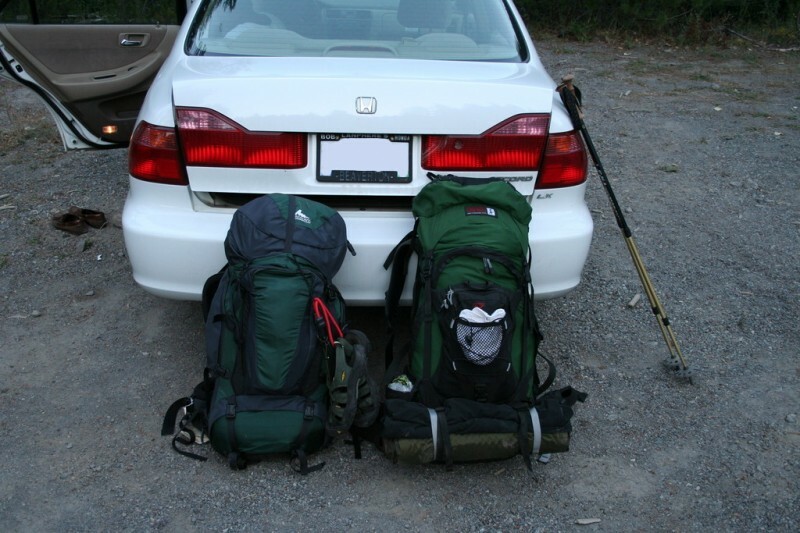 It made for two heavy packs, but it wasn't too bad, and it was sort of nice to have the luxury of so much space. After Sam got his tent up I eventually finished setting mine up as well. After Sam finished getting his tent up he got out his stove to start making dinner. I think we ended up switching to using mine after a while because for some reason his wouldn't stay lit. We still don't know what the deal was with that. Sam suggested making a fire in our nice fire pit. I didn't feel up to trying to get it started, so I let him do it if he wanted to, but eventually joined in. I was very glad we were able to get it going because it provided warmth enough to sit outside and talk and read for hours when otherwise it would have been freezing. I was reading the Bible at this time using a plan that is set up so you read it all the way through in a year, but I was several days behind. So, I really enjoyed sitting in my Therm-a-rest chair by the fire and reading for at least an hour. There's something about sitting around a camp fire that is one of the most pleasant environments ever. I guess it brings back good memories. 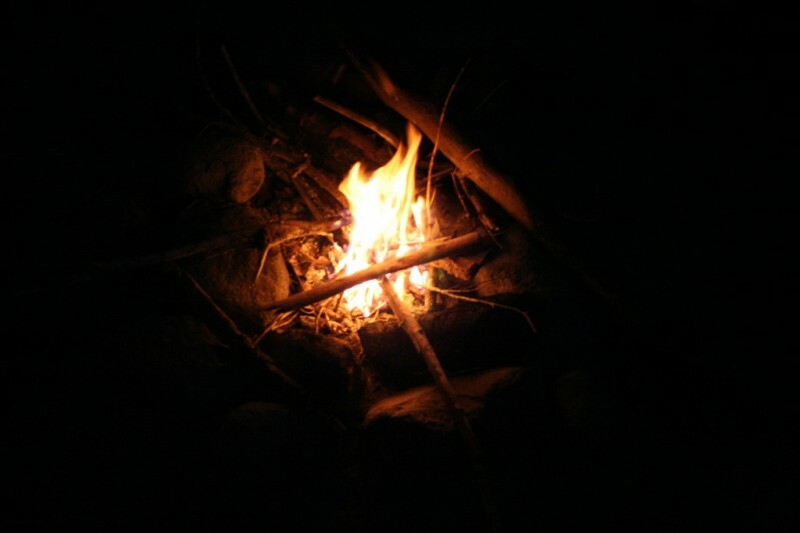 Eventually, after reading, talking with Sam and enjoying the fire for several hours it was time to hit the sack. 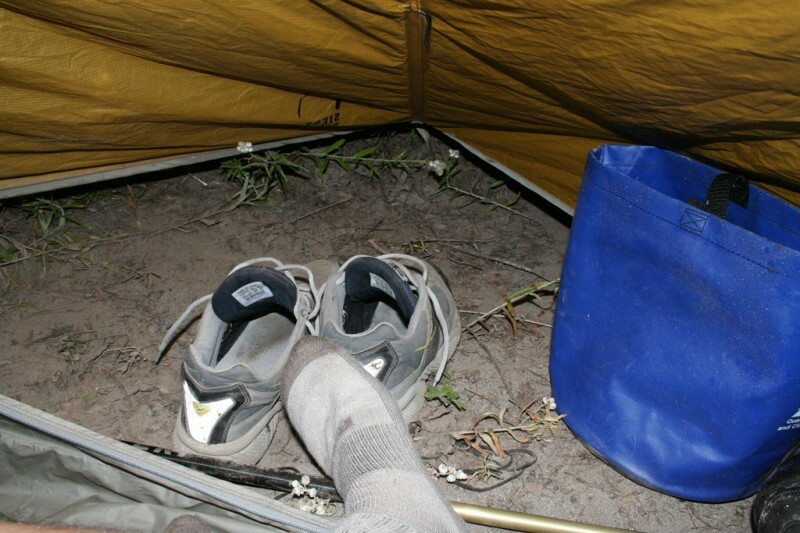 I left my shoes and water in the vestibule but kept my socks on for the cold night. As I mentioned before, the next morning we set out from camp with just a few essentials and made our way to the meadows which were our destination. This scene was kinda neat looking as the tree roots made a stairway behind a trickling waterway. 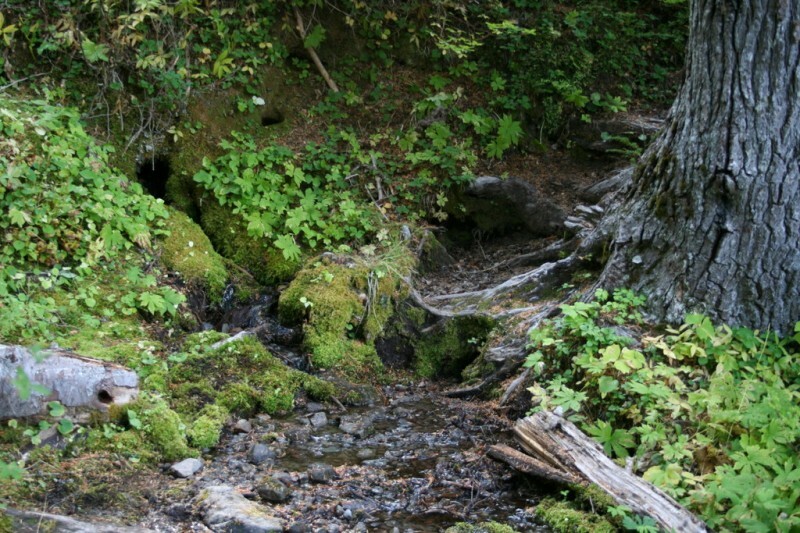 Just to the left water was slowly tunnelling down beneath moss covered roots where it emerged and trickled across the trail before continuing its decent to the main creek far below. It was a little difficult finding dry patches to step on here, but we made it without getting our shoes too muddy. Just a little while after we climbed the tree root stairs and went around a bend we came to this straight stretch where we could see clear evidence of a fairly recent fire (perhaps last year) to our left. 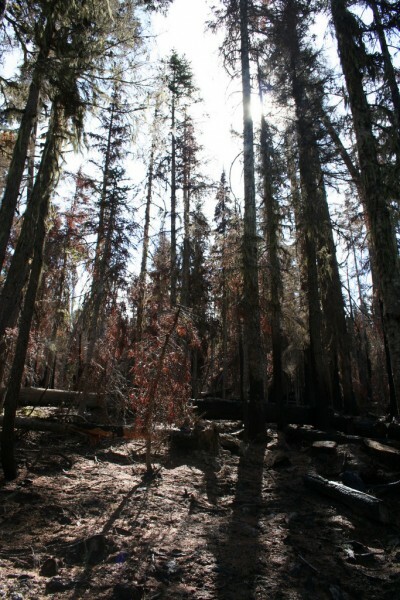 It was sort of picturesque how the sun was shining through the blackened trees, creating highlights and long shadows on the ground. 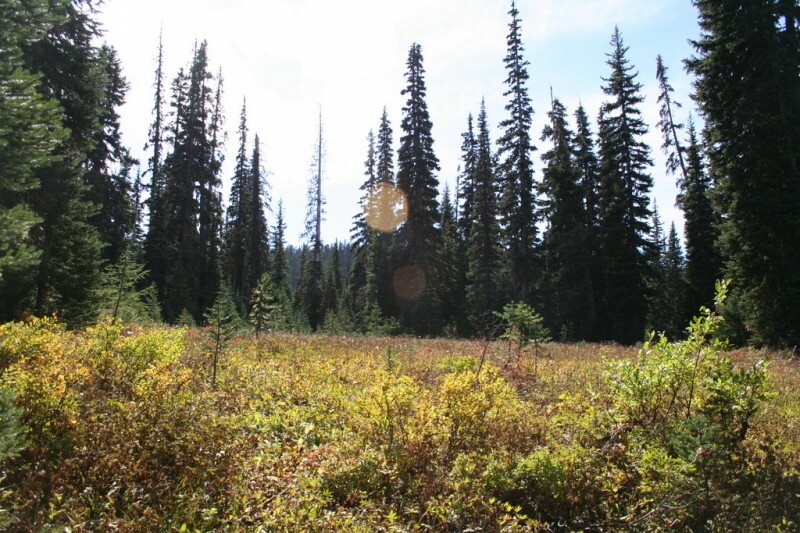 It was fairly cold where we were hiking, so it was nice that there was a blue sky above, and we enjoyed feeling the sun's warmth when we got to clearings like this and eventually when we were at the meadows. 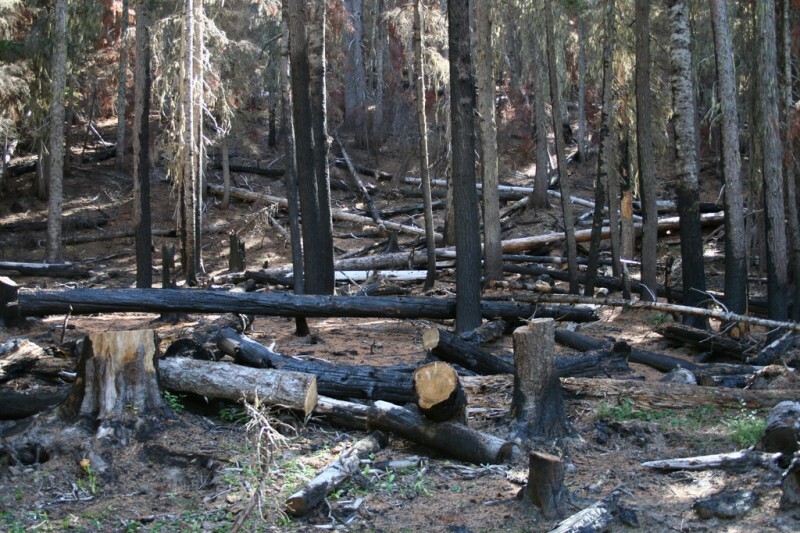 Here is one last view of the area affected by the fire before we moved out of that stretch. If you look at the map of this trail you will see that it follows Cold Spring Creek for the majority of its length. 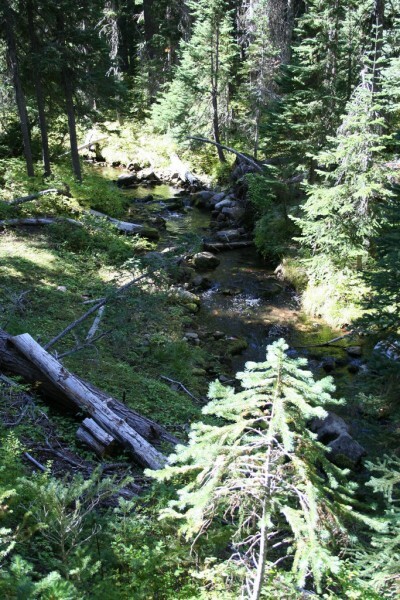 However, between the crossing near our campsite and Elk Meadows the trail gradually gains elevation and the creek stays far below until they begin to converge again near the meadows. 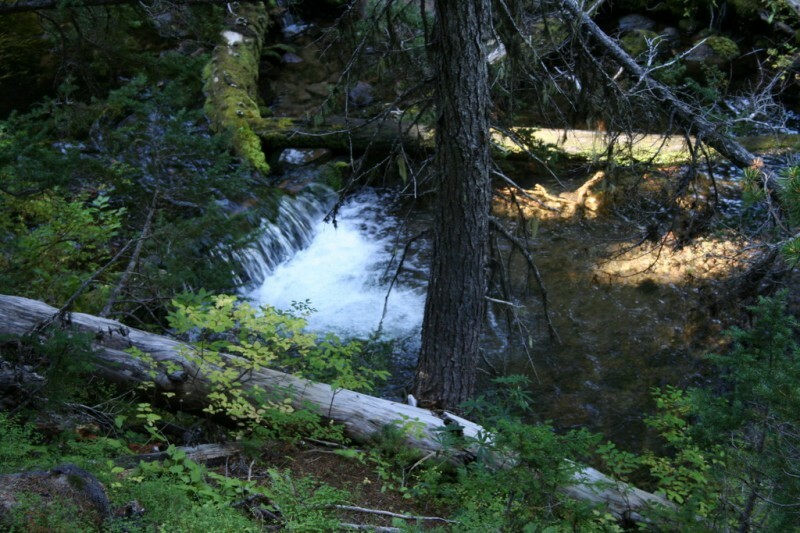 At this point we were getting close to the meadows and the trail afforded a great view of the creek and this little waterfall. 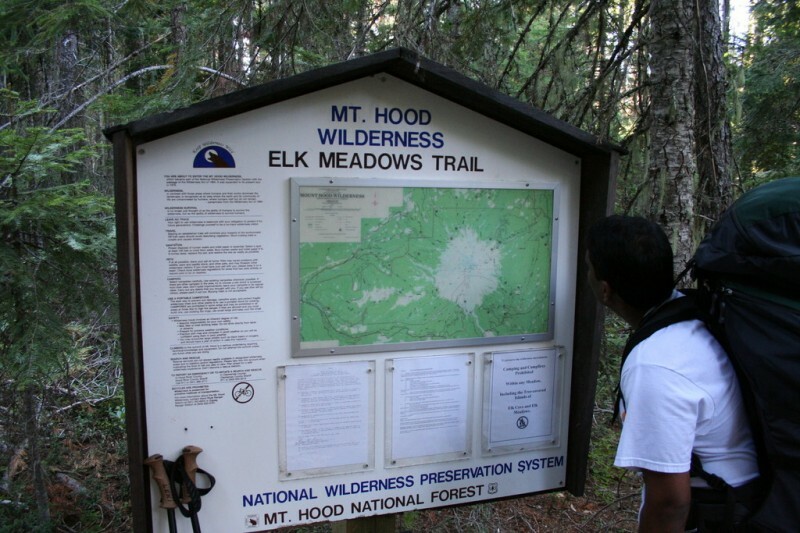 Finally we had arrived at the meadows, or at least to the trails that go around them. This was the juncture where you could either go clockwise or counter-clockwise around the meadows. We decided to go to the right. 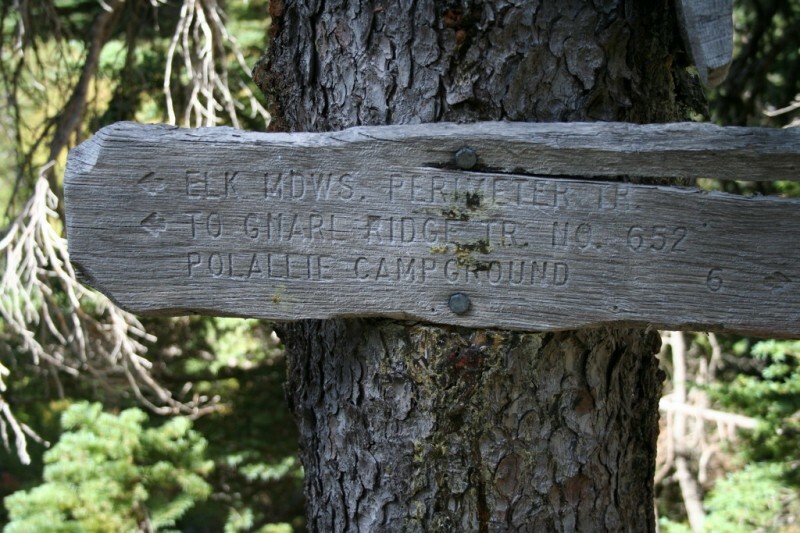 A closer look at this sign shows that it is six miles to where we parked at the Polallie Trailhead. The map said seven miles, but perhaps it was including walking all the way around the meadows? 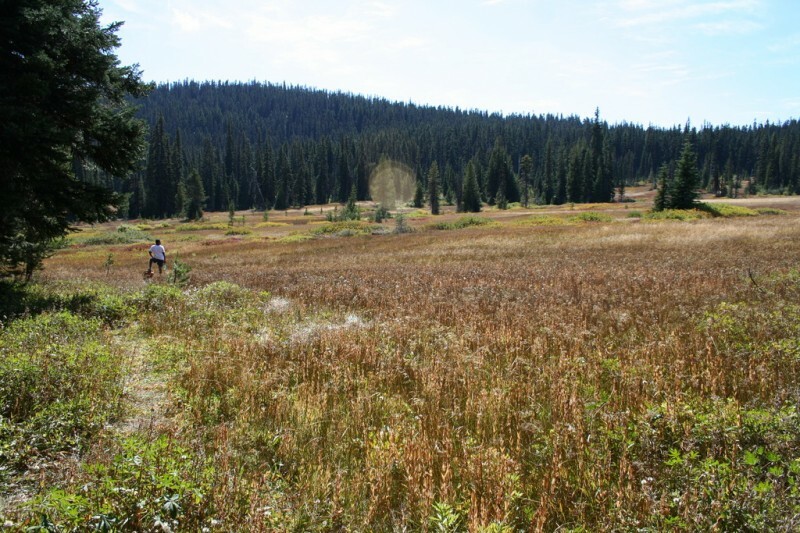 Here was our first view of Elk Meadows. The colors were really nice. 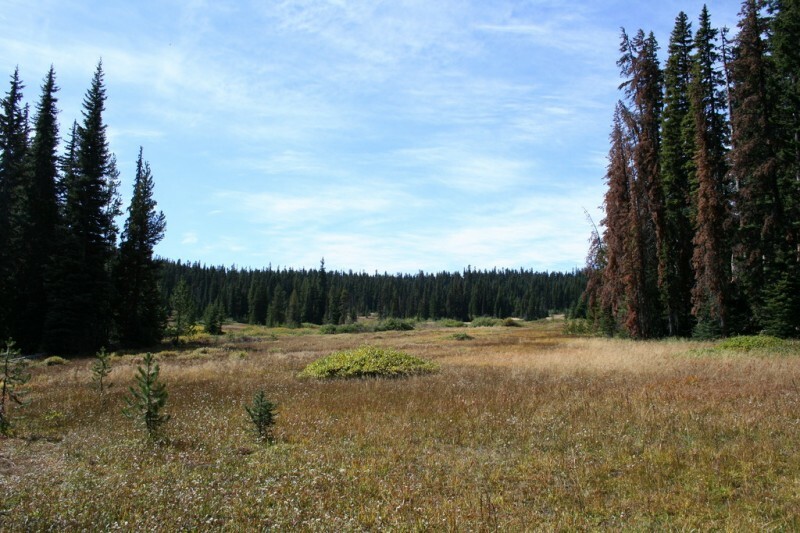 This was just a small section of the multiple meadows. We continued on counter-clockwise looking for more views and a place to sit and eat our Cliff Bars. This trail through the edge of the meadows was just packed with yellow jackets. Neither Sam nor I are big fans, so we hesitated to stay in those areas for too long. Another early view of the meadows. 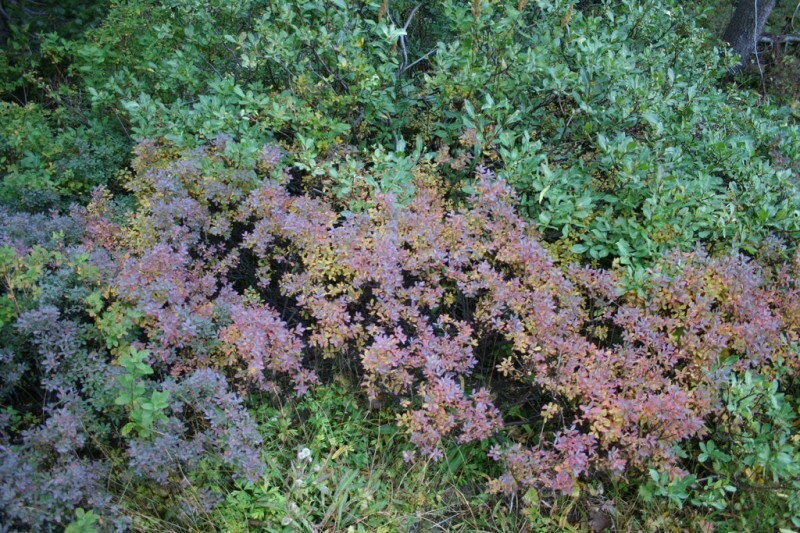 This photo is a little dull, but I thought the changing colors of the leaves on this bush were pretty cool looking. 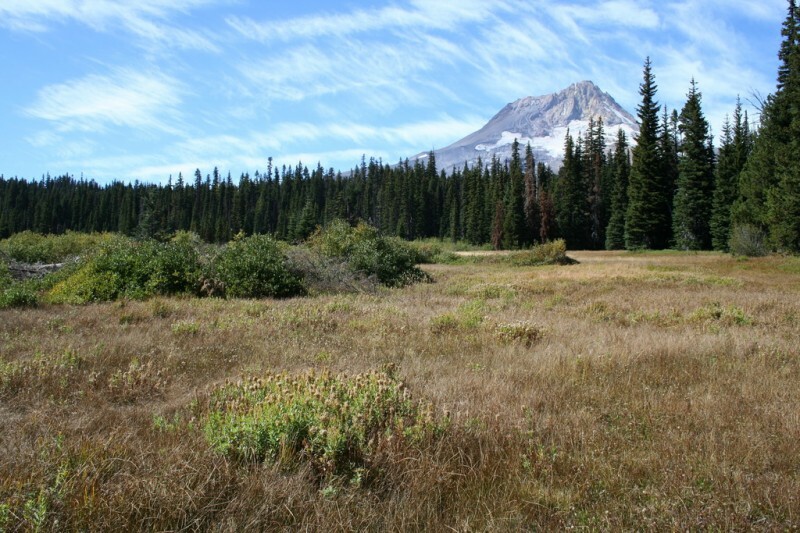 In general the shades of browns and greens in the meadows were really nice. After walking maybe a quarter of the way around the perimeter trail, we came across the first group of people we had seen the entire trip. There were three people sitting on a log eating lunch in a spot with some great views. Although that site was amazing, we decided not to disturb their peace and to look for another spot for ourselves. 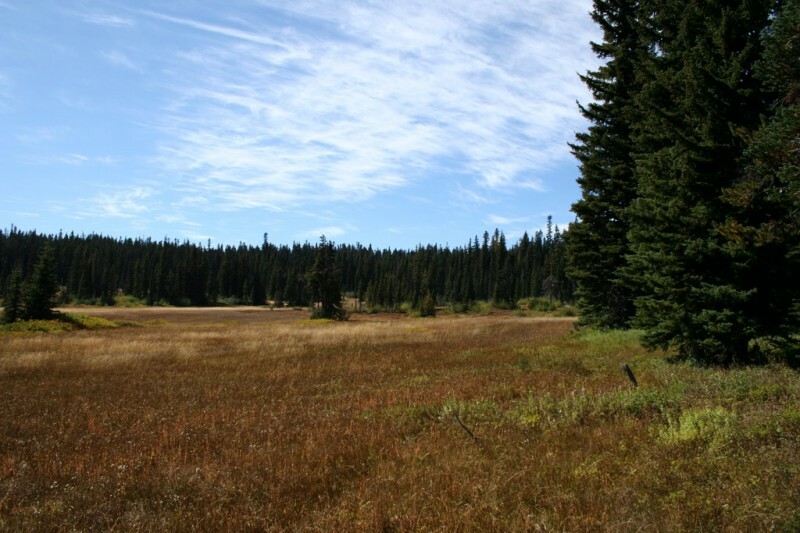 We backtracked a little bit and found another spot with a good log to sit on that afforded this nice view of the meadow. Unfortunately the yellow jackets were very numerous here so Sam went off to get some peace and a different perspective on the meadows. The same spot just to the right of the last photo. 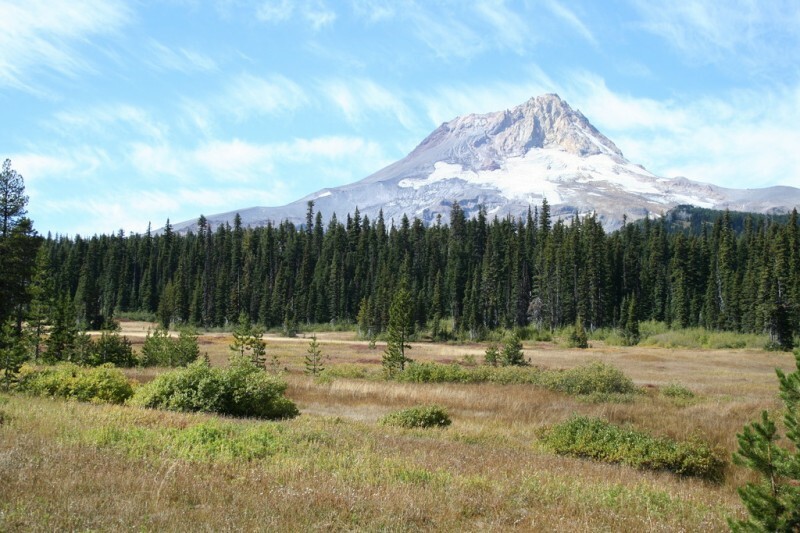 Sam had heard that there was an old shelter that was on the edge of the meadow from which there was a great view of the mountain, but as yet we hadn't seen the mountain or the shelter. So, we ventured back around the way we came and continued clockwise around the perimeter trail. On our way around the other way we spotted the shelter a ways off and headed in that direction while continuing to look for the mountain views. This was one of our first spottings of it before we actually found the shelter. As we got closer to the shelter area the views kept getting better. We finally arrived at the shelter and the view was beautiful. 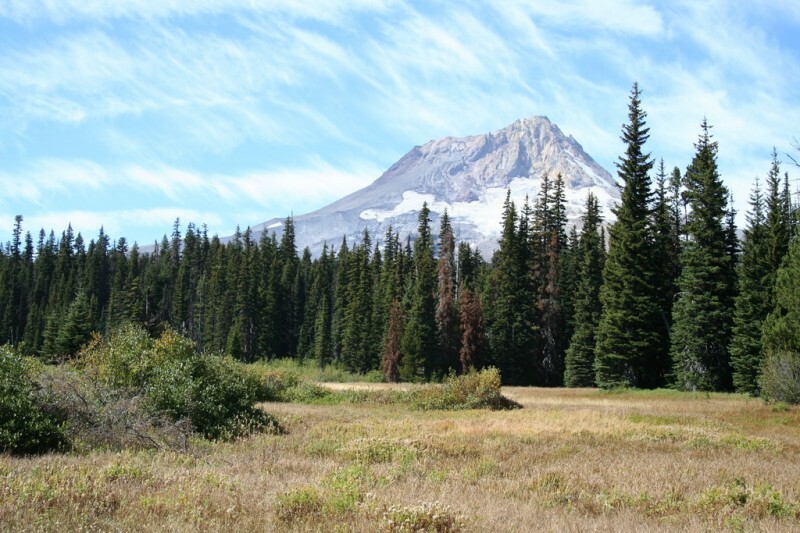 The whole mountain was visible unobstructed by the trees in the foreground. We really almost missed this view, and would have if we hadn't gone around the other way on the perimeter trail. 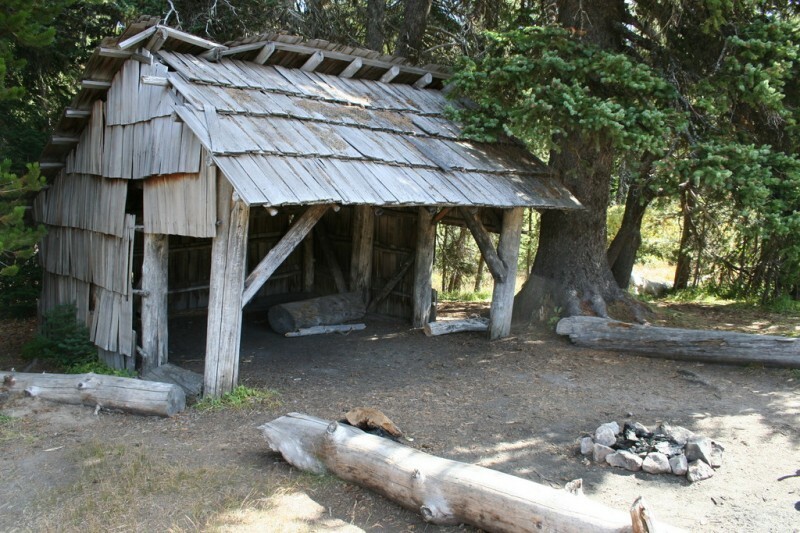 This was the little shelter that Sam had read about. 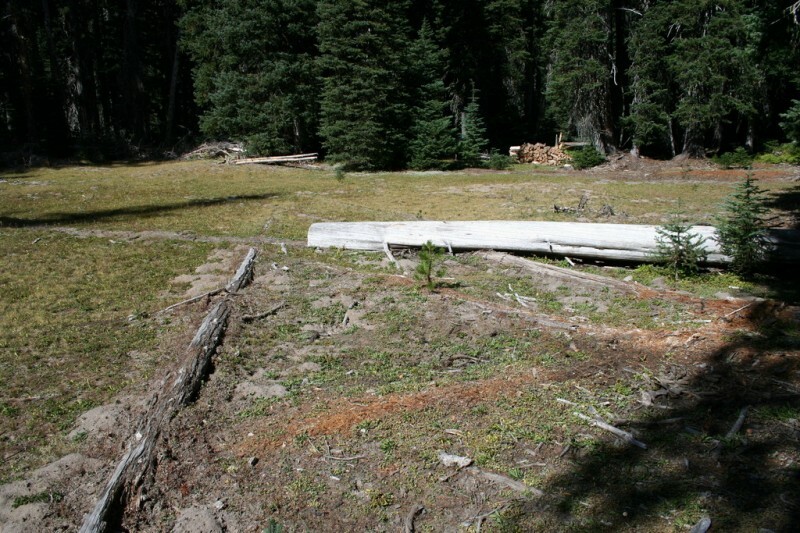 I guess you are not allowed to camp in the meadows now, but it looks like this was or still is an exception. It's clearly established with a nice fire pit and logs to sit on. Although I prefer untainted wilderness to signs of civilization when I'm hiking, this was a pretty neat find. When we arrived at the shelter we found the second group of people we had seen during the trip. They were a middle aged couple who said they lived only a few minutes away from the trailhead and who had come here frequently throughout their lives. They had come up the shorter route and brought wine, cheese and chocolates to enjoy a nice picnic in the meadow with spectacular views. 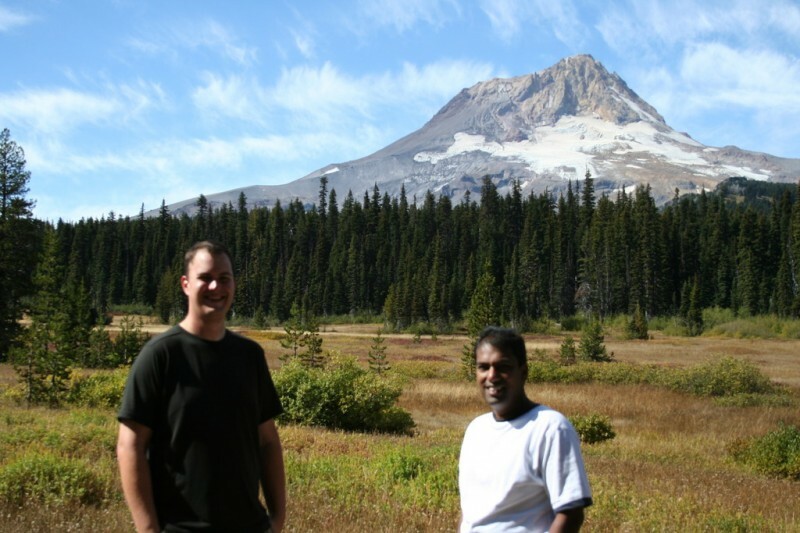 The gentleman was kind enough to take a photo of Sam and I with Mt Hood in the background. After talking with that couple and taking photos of the mountain we decided it was time to head back, lest it get dark before we got back to the car. 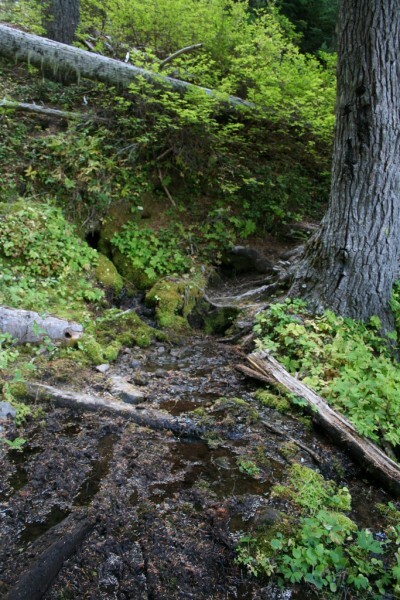 This was one of the little creeks that ran near the meadow that we saw and crossed on our way back to the main trail. Fast forward an hour and a half or so, and we were back at our camp site, ready to eat lunch and start packing up camp. 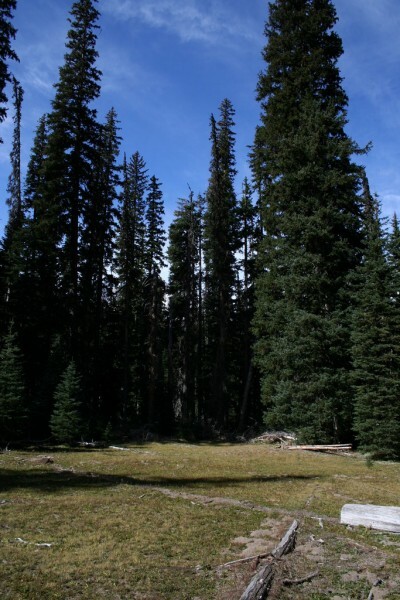 I took a few photos of the more vertical views from the campsite as I was sitting there eating. 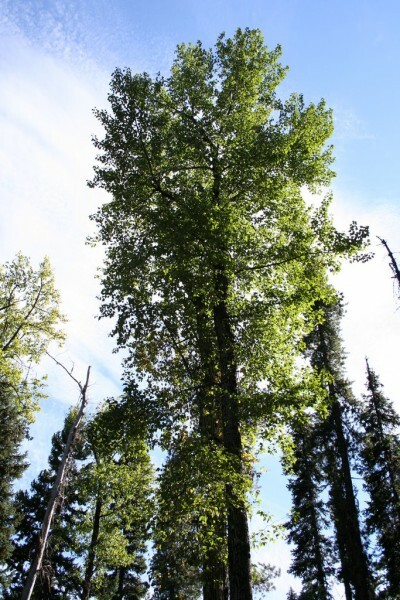 I thought it looked really cool how the sun was illuminating the leaves of this tree that towered above our campsite, just across the creek. 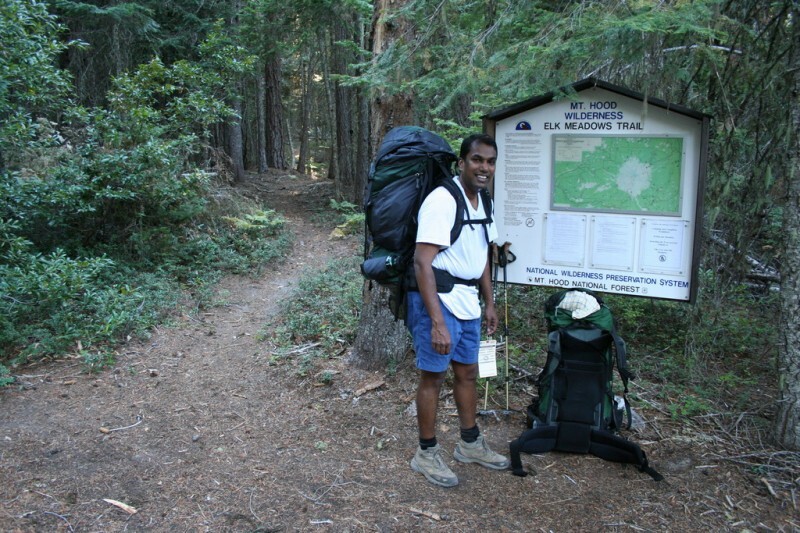 So, fast forward another hour and a half or so, and we had packed up our gear and headed back toward the trailhead. 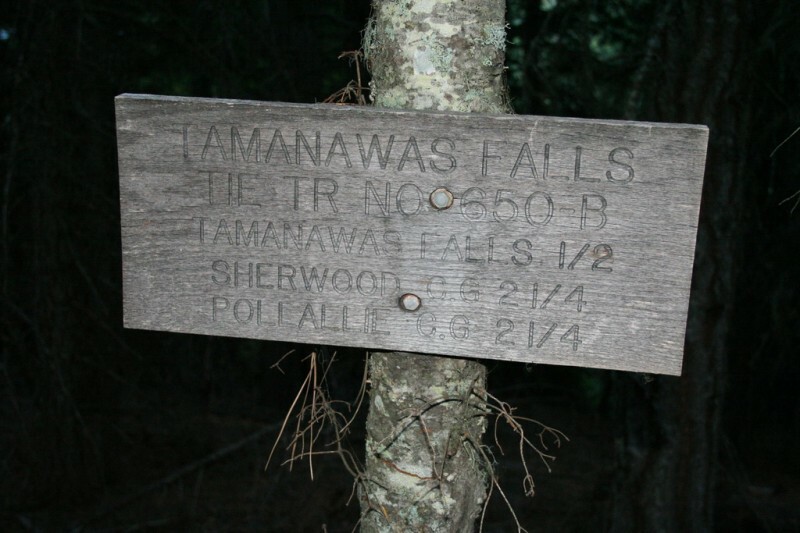 On the way in we had passed a sign pointing to "Tamanawas Falls" and we had made a mental note that we should check that out if we had time on the way out. 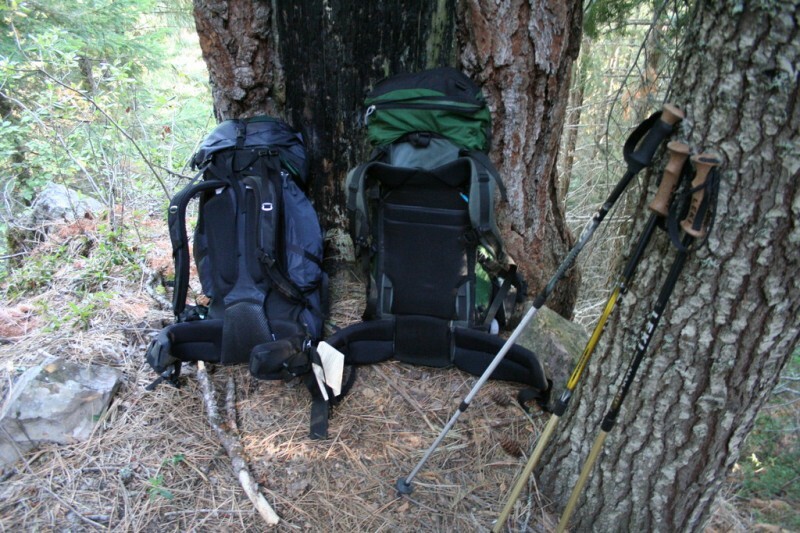 I wasn't sure if I would feel up to an extra one or two miles added to the trip out, but when we got there I did feel up to it, so we left our packs here and headed down to explore the trail that pointed to the falls. Well, the trail went down, and down, and down some more. It was pretty steep and was taking quite a while. Eventually we came to this section where the terrain was completely different than anything we had hiked through before. 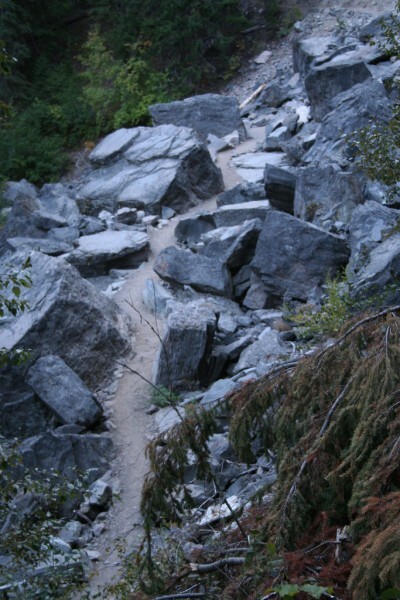 These huge boulders dominated the landscape and made for an interesting change of scenery. I stopped to take a photo while Sam checked out what was ahead. He was very sceptical that the mileage on the sign was accurate, and I think he was right, it was farther than the sign said. 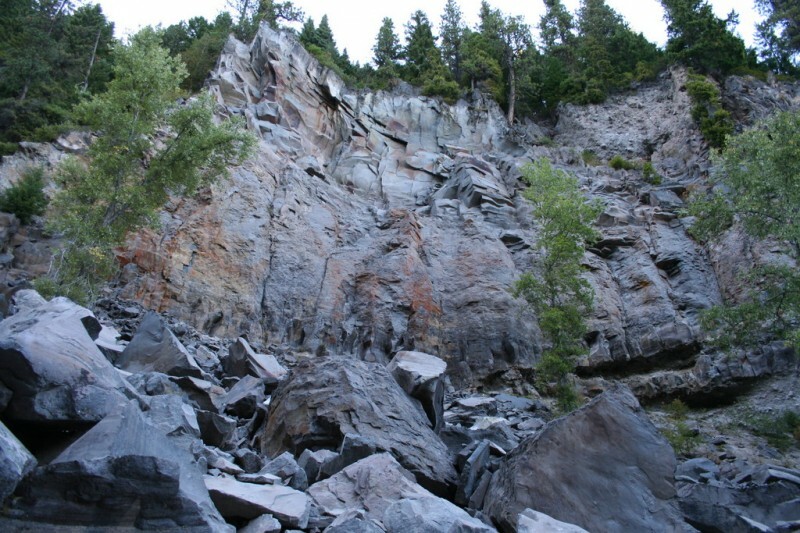 This was the view looking up from the rocky terrain that last photo was taken from. The main trail was all the way up at the top of that, so you can see we dropped a decent elevation. 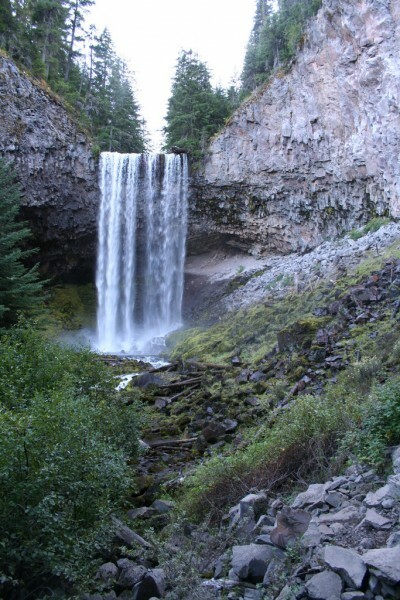 Sam was tired of going down knowing we would have to go back up, and knowing that the distance was longer than what the sign said, so he headed back and I stubbornly kept going, since I love waterfalls and had already come so far. I was very glad I kept going. The trail went up from the rocky area and then back down again a little more and eventually found its way here to the falls. What a cool sight hidden away down here. I kept going for a closer view. Closer still. 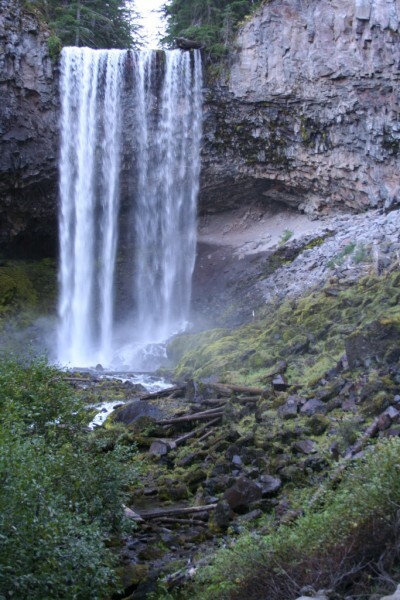 If you look near the top of the falls, it looks like there's a log on the right that is surely about to fall. 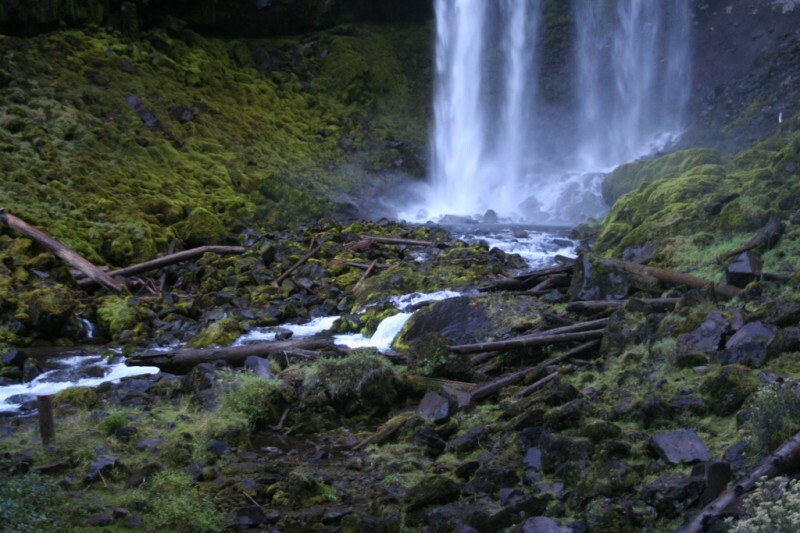 I love the deep greens of the moss on the rocks near waterfalls. The contrast with the brightness of the white-water is beautiful. 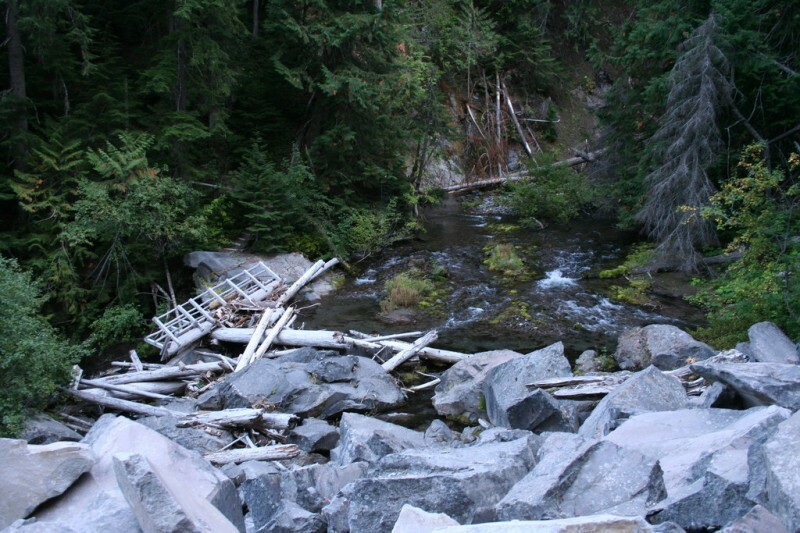 On the way back to meet up with Sam, as I approached the rocky area again I saw this bridge down in the creek that had evidently been washed out sometime earlier. It seems to be in pretty good condition, so who knows how recently it happened. Interesting. I was curious where the bridge used to be, and if the path it joined was no longer accessible now that it was down, or if there was a replacement of some sort in its place. 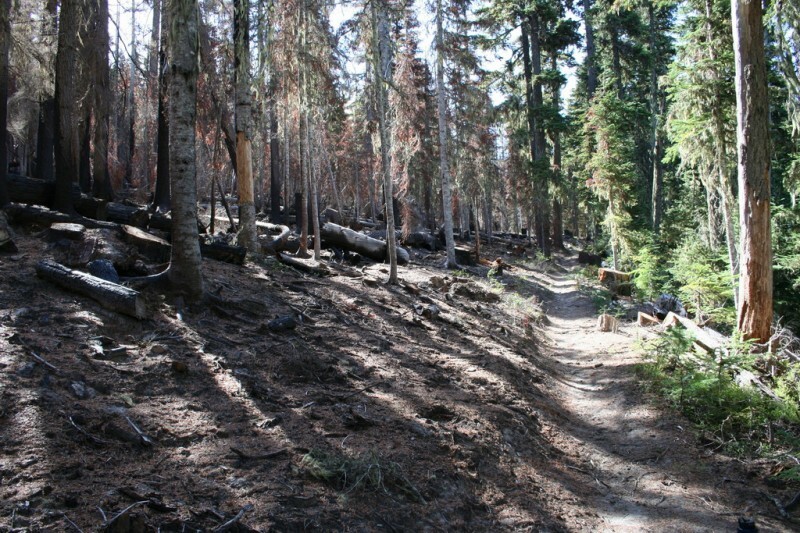 It would be really interesting to be one who works on maintaining or building trails. I honestly have no idea how they do it sometimes. 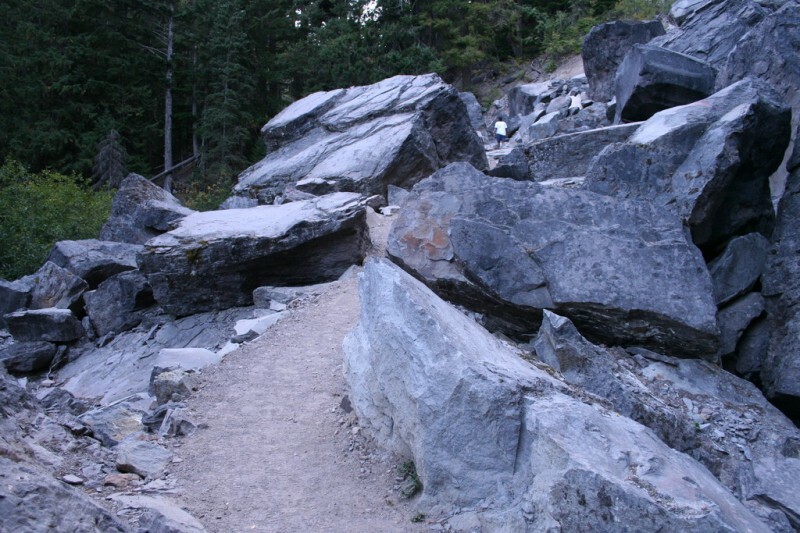 On my way back up the falls trail to the main trail I looked back and saw the path as it cut through the boulders. It looks kinda neat. I enjoyed the change of scenery that the rocky terrain area provided. This sign was the one Sam disagreed with. 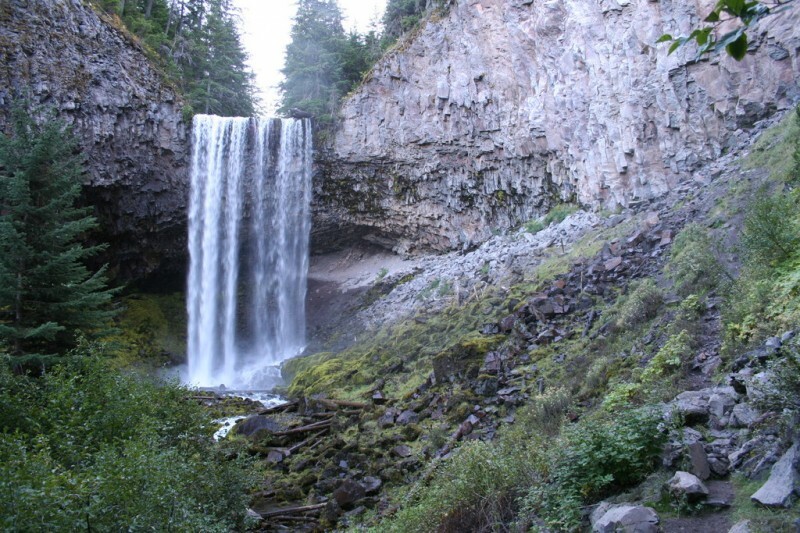 We're pretty sure it's more than a half mile from there to the falls. 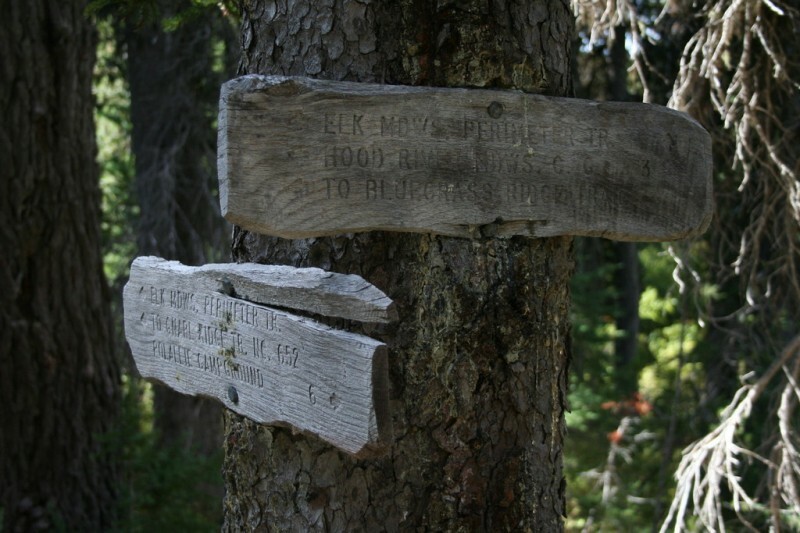 We think perhaps it means a half mile to the junction with the other trail (the rocky area). I'm not sure. I'm not great at reading maps or estimating distances. But yeah, it wasn't more than a mile. Maybe about a three quarters of a mile each way? As you can see, I guess at this point we were two and a quarter miles from the trailhead, the car and rest. Two and a quarter miles later, we're back at the car, ready to sit down and also ready to eat some tasty Indian food, which we did a few hours later when we got back in town. It was a great hike. I would definitely recommend it.